Japan loves robots, we know that much. Last year, the Japanese government announced it plans to to send a robot to the moon by 2020 (that was to be joined by a human astronaut 10 years later). 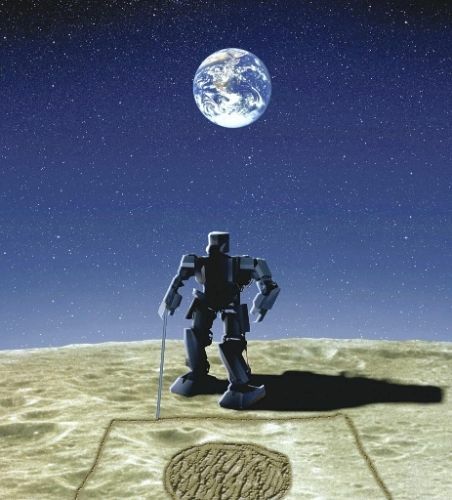 Today, the Osaka-based “Space Oriented Higashiosaka Leading Association” (SOHLA) announced [JP, PDF] a quite similar undertaking: putting a robot on the moon by 2015. The association, which consists of six private space technology companies and has connections to governmental space research institutions, estimates it will take a whopping $10.5 million to make the project work. But SOHLA says one in two Japanese knows the name of the satellite it successfully launched into orbit last year, Maido-1. The reasoning goes that this popularity and potentially positive effects on the local economy are enough to justify the cost for the bipedal humanoid, tentatively named Maido-kun. What’s weird is that the moon robot the government had in mind last in year was to explore what natural resources Earth’s satellite offers (Japan is poor in natural resources). The only known mission of the SOHLA humanoid at this point, however, is to put up a Japanese flag on the moon, demonstrating the country’s dominance in robotics.